The Prince of Disks (Knight in the Rider-Waite tradition) is the card representing the personality that arises from the Airy part of Earth. He is the abstract and principled aspects of practicality and steadiness. As such, he is a little bit of a contradiction; he represents the two sides of the dichotomy of Air and Earth coming together in one being. As such, the Prince of Disks excels in Practical Knowledge, and Lacks Emotions. He is prone to slow, Ponderous movement and is also Meditative. He has both the mental force of Swords and the physical force of Disks, and so quickly can becomeUnstoppable. He thinks things through before doing them, and so is Thoughtful, and also Ingenious, able to apply to apply his ideas to the real world and Solve Problems. He is Trustworthy, Solid, and Dependable. He is actually veryEnergetic, but only when he becomes driven to be so, a process which takes a long time; he is Slow to Anger, but when angry is Fierce. He is also Slow to Change is Mind and a Slow Learner, but he still does learn, and Grows slowly and steadily. He is a hard and Steady Worker, and a Competent Manager; he can apply his ideas to reality when he needs to, though he does not excel at it like the Princess of Swords does. 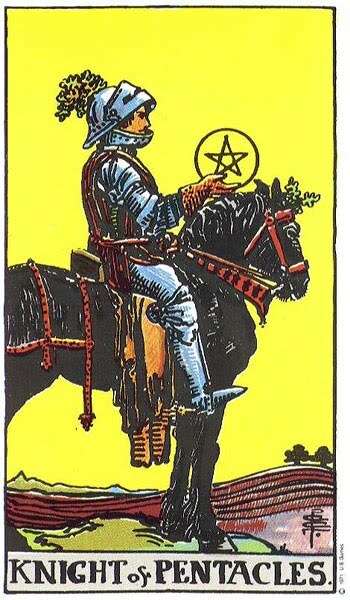 The Rider-Waite art shows a knight, halted and carefully inspecting a Pentacle held in his hand. This card mirrors closely the Thoth deck’s Knight of Wands, and indeed even shares the same name, and has many of the same meanings. His horse represents the idea of powerful movement, and his heavy armour some degree of caution. The Thoth illustration shows a naked man holding a disk riding s chariot pulled by a fearsome-looking oxen of some kind. The chariot (and the ox) looks very heavy, and its motion is the very definition of what this card stands for; slow to get going, but impossible to stop and very difficult to change direction once it gets going. He is surrounded by symbols of plants; emphasizing the diea of slow but steady growth, as well as stability and dependability (the stable build of the chariot also reinforces these ideals). In a reading, this card asks you to examine the role that people with this personality play in your life. Do you know anyone who thinks slowly, but once set on a task will complete it at any cost, and woe to any that try to change his mind? Anyone who can solve any problem given enough time? Reversed, this card’s energies are hidden or blocked; perhaps they are not quite unstoppable, or they may put on a show of bravado about how they can do anything and no one can stop them, but back down at the first sign of strong opposition.